A back injury derailed Cynthia Jemmott’s quality of life in Barbados with no hope of improvement for several years. In December 2015, Jemmott fell and fractured her thoracic spine (her mid-back). When she sought treatment for the injury, doctors told her she had cancer in her spine. Jemmott spent more than six months in the hospital down in Barbados. Treatment of the cancer left her back unstable, and she lost feeling in her legs and couldn’t walk around. Her prognosis wasn’t good, as her son, Julian Jemmott, recalled. “We kept being told it was OK and would sort itself out,” he said. Frustrated and compelled to do more, Jemmott and her family reached out to her sister, Marva Pierce, who moved to the U.S. in 1992 and lives in Poplar Grove. Pierce researched spine surgeons and landed on Dr. Fred Sweet of Rockford Spine Center. Jemmott sent her medical records to Dr. Sweet, took a chance and flew to the U.S. to meet with the surgeon in June 2018. Since her 2015 injury, she’d regained the use of her legs but still needed assistance with basic movements. 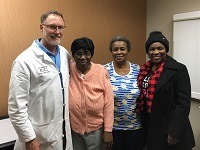 At Rockford Spine Center, she got a new MRI and new X-rays and learned that her T-level spine had completely disintegrated because of her injury. The good news? Dr. Sweet said he could help. Dr. Sweet and Physician Assistant Sean Soare performed a Transforaminal Anterior Release (TFAR), a method Dr. Sweet devised in 2005, on Jemmott’s T9-L1 vertebrae in September 2018 at OSF Saint Anthony Medical Center. Using TFAR, Dr. Sweet can straighten the spine without cutting through bone, resulting in shorter operating times and less blood loss. The surgery was scheduled for four hours but only took two hours, as Dr. Sweet didn’t need to do as much work to strengthen the area as he had expected. “What she needed was a solid connection on the spine,” Dr. Sweet said. “We put in screws, rods and a bone graft, which created a solid bridge across the weak area of her back. That’s what relieves the pain and lets her get up and move around better. Because of the unique circumstances of the case, RSC and OSF relieved Jemmott’s financial burden by classifying the treatment as charity care, and vendors discounted services, too. Jemmott said she woke up no longer in pain and was walking around her hospital room the same day as the surgery. Several family members traveled from Barbados to visit Jemmott while she was in the U.S. being cared for by Dr. Sweet. Her sister, Beverly Haynes, said one of the most humbling parts of the experience was Dr. Sweet praying with the family before surgery.